At the beginning of the year I set out on a mission to read ALL of Rick Riordan’s books, starting first with a re-read of the Percy Jackson series, then moving on to The Heroes of Olympus series, and so on. I’d wanted to start the Heroes of Olympus series for quite a while now, and I was thrilled when the time finally arrived to start the books. Having just finished The Blood of Olympus, which is the fifth and final book in the series, I can honestly say that I enjoyed this series just as much as, if not even more than, the Percy Jackson series, which I love! I absolutely hate to see this series come to an end, but I definitely enjoyed the journey, and I’m excited to move onto the next series now! 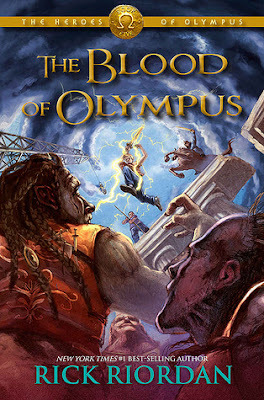 As I mentioned above, The Blood of Olympus is the fifth and final book in the Heroes of Olympus series, and I was super curious to see how the series would come to an end. It has been such a wild ride over the course of the past few books, I didn’t really know what to expect, but I enjoyed this final journey, and I think the storyline came together rather nicely at the end. One thing I enjoyed the most about the books, besides the awesome characters, was the mixture of Greek and Roman mythology, which I really didn’t know much about before starting the books, but feel like I know a lot about now, and I’m definitely interested in learning more. There are SO many characters to love in this series, even though Percy and Annabeth will always be favorites of mine. The rest of the crew is great as well; Jason, Piper, Leo, Frank and Hazel, as well as Nico and Thalia and so many more. I even love Coach Hedge, who I never really expect to like, but he’s just one of those characters that you can’t help but love. As are so many characters in the story! I didn’t expect to see so many from the Percy Jackson series in the Heroes series, but I was pleasantly surprised to see them in the books, and that makes me curious to know if there will be any appearances in the other series by Riordan. We shall see, I suppose! Having finally finished this series, I’m now preparing myself to move along to the Kane Chronicles series next! This series has only three books in it, and I’m hoping to have all three of them read before the year is over. One of the perks of waiting until a series is finished before you read it is that you don’t have to wait a whole year or more to read the next book in the series. (Instant gratification is a wonderful thing at times!) I really love that I get to read these books back to back without the long wait. Overall; I enjoyed the Heroes of Olympus series SO Much more than I expected to! I absolutely hate to see the series end, but I’m excited to move on to the next books as well. If you read and loved the Percy Jackson series, and haven’t yet picked up The Heroes of Olympus, do it. I know you’ll love the books just as much as you did the original ones. Check them out! !